Did you love your experience at Boise State University and want to share it with others? Now is your chance! We are so proud of this university and the success of our graduates that we want to give you a chance to share those successes and experiences. The Alumni Ambassador program offers the opportunity for alumni to engage with prospective students and their families in the recruitment process. You will have the opportunity to share your Boise State story, provide encouragement, and serve as a resource for students and their families as they go through their college selection process. We want to give prospective students a glimpse into what makes Boise State University and the Boise community so unique. Interested in helping our admissions staff recruit future Broncos across the West? You will have the opportunity to attend and assist with various recruitment events in your area by highlighting your Boise State experience, mingling with students and their families. This is your chance to tell prospective students how Boise State has supported your journey and prepared you for the future. Do you have a passion for helping us recruit future Broncos? 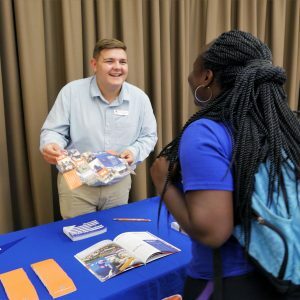 If so, now is your chance to represent Boise State by volunteering at college fairs in your area. You will have the opportunity to provide prospective students and families with Boise State materials, academic and application information, and valuable insight on what it means to be a Bronco! No prior knowledge or experience is required. Training and materials will be provided by the Admissions Office. Do you know a high school student who would make a great addition to the Bronco Family? We’d like to get to know them, too! Refer them to us now, and we’ll ensure that they will receive Boise State admission materials. Help keep Bronco Nation strong! Each year incoming students make important decisions about where to attend college. We would love for you to share what you valued most about your time at Boise State by sending handwritten notes to potential new Broncos! Pre-addressed cards and stamps will be provided by the Alumni Office.